SURPRISE, AZ -- (MARKET WIRE) -- May 29, 2007 -- Marley Park residents joined in the grand opening celebration of the Heritage Club at Marley Park, the community's new 5,948-square-foot residents' recreational facility, which opened on April 28. 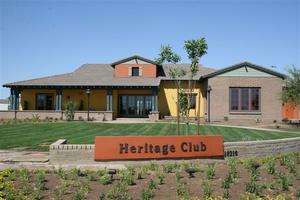 The Heritage Club is open to residents of Marley Park, a DMB community in Surprise, Arizona. Situated on approximately 2.8 acres and located across the street from the Marley Park Welcome Center, the Heritage Club includes an outdoor event lawn, multipurpose spaces, demonstration kitchen, teen room and meeting spaces with state-of-the-art technology. Heritage Community Pool is scheduled to open later in the year and will be located adjacent to the Heritage Club on slightly more than 2 acres. Envisioned to represent an early 1900s farmhouse, the Heritage Club is designed to feel like a home that has been expanded over time to meet a family's growing needs. In the Heritage Club, the multipurpose room and demonstration kitchen are the modern incarnations of what would have been the original home's structure, while a wide hallway connecting the multipurpose room to the rest of the home contains design elements that hint at its use as a wrap-around porch in an earlier time. At the front of the Heritage Club, residents of the Surprise, Arizona real estate community enter through a space that in times past would have greeted guests as a family's "best parlor." A small conference room evokes an imagined earlier purpose as a dining room or "keeping room" with a farmhouse-style kitchen table. The teen room and offices for the Marley Park Community Association are housed in spaces that might have been additions for guest rooms and extended family bedrooms. Teens and pre-teens were consulted to influence the design and functionality of the Heritage Club's teen room. Based on their input, the teen room features lounge and study areas with eclectic furnishings and bold colors, patterns and textures. To maintain the character of a traditional home, technology has been artfully integrated throughout the Heritage Club. The farmhouse kitchen table in the small conference room is outfitted with built-in data, cable and phone plates; plasma televisions broadcasting the Marley Park community channel are housed in old frames; in-ground plates for power and technology are built into the floors; and computers for resident use are concealed behind built-in cabinets. The Heritage Club is administered and operated by the Marley Park Community Association. Through resident involvement and partnerships with local organizations, the Community Association will offer innovative programs at the Heritage Club designed to promote social, civic, educational, cultural, health and wellness, recreational and artistic activities in the community. Residents can use the space for formal or informal, personal, family and business activities. The club provides year-round opportunities for outdoor activities including open lawns for play and events; a gazebo for performances, weddings and other special events; and a built-in barbecue island. "The Heritage Club is a place where residents can come together in large groups and small, for formal events or family celebrations, or even to just find a quiet corner for personal study," said Dan Kelly, general manager for Marley Park. "This community, now with nearly one thousand residents, has proven to be engaged, neighborly and eager to participate with one another. The Heritage Club will be a place where many memories will be made for these founding residents and generations to come." The Heritage Club was designed by Haven Design and MICE North America and built by Newman Jolly. It is located at 15210 W. Sweetwater Avenue, just south of Waddell Road and east of Reems Road in Surprise. Marley Park is designed to be a classically styled Surprise, AZ home community celebrating the most valued characteristics of traditional neighborhoods. Taking its cues from the area's rich agrarian history, the community of Marley Park emphasizes open spaces, shade trees and diverse and traditional architecture. For more Surprise, Arizona information and on these new homes in Arizona, visit www.MarleyParkNews.com. Marley Park is being developed in phases by Marley Park LLC, an affiliate of Scottsdale-based DMB Associates, Inc. (DMB). DMB is a diversified real estate investment and development firm with real estate holdings through affiliated companies that include current and planned resort/recreational and primary residential communities, signature commercial developments, country clubs, hotels, health clubs and spa properties. Founded in 1984 and headquartered in Scottsdale, Ariz., DMB is one of the most active community developers in the West, with properties in Arizona, California, Utah and Hawaii. The firm's name is synonymous with high-quality real estate developments.